Santa Fe NM: Jaime Clinton, Executive Sous Chef for Catering, represented UNC Charlotte well at the Southern Regional Conference of the National Association of College and University Food Services (NACUFS) Culinary Challenge event, held last week at the University of New Mexico. She took second place in her first time competing. The NACUFS Culinary Challenge is the conference’s headliner event, designed to showcase outstanding food preparation and presentation skills in collegiate dining services. Chefs are chosen to compete based on their original recipe for a main protein chosen by conference leadership, which this year, was pork. As contestants, they are given one hour to prepare and plate their dish before a panel of American Culinary Federation-approved judges and an audience of observers. They must display requisite techniques and cuts in the process. Apparently she did so. Judges’ remarks state that her dish was colorful, had great flavor, and that the pork was cooked perfectly. Jaime Clinton has been serving UNC Charlotte for four years; two at Center Center and two at main campus. Her victory marks the third year in a row that a UNC Charlotte chef has brought a silver medal back to Charlotte. Brining: Soaking meat in a strong solution of water, salt, herbs, spices and sweetener to tenderize, flavor and reduce cooking time. 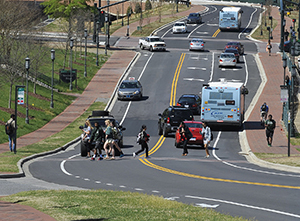 UNC Charlotte Parking and Transportation Services has entered into an agreement with Gotcha Bike to bring bike sharing to campus. The program will launch later this Spring with 100 Gotcha™ bikes and 10 rack corrals located in strategic points around campus. "Bike sharing is part of PaTS' long-term transportation demand management plan to provide transportation alternatives for faculty, staff, students and visitors," said Helena Connors, PaTS Transportation Manager. "The Gotcha program is a natural, sustainable addition to current options such as campus shuttle service and car sharing by Zipcar™." Information about how to join the program and use the bikes to come. Check for updates at pats.uncc.edu/bike. Gotcha Bike provides bike share programs at 18 college, residential and corporate campuses across the U.S. Gotcha Bikes are the nation’s smartest, thanks to Gotcha Bike’s partner, Social Bicycles, and proprietary GPS technology that allows users to locate and access the bikes via a smartphone or computer. Durability features of the specially made bikes include lightweight and rustproof aluminum frames, waterproof Kevlar seats, belt drives and puncture-resistant tires, which offer a maintenance-free smart bike. The bikes’ integrated technology and flashing safety lights are powered through a built-in solar panel and dynamo hub, giving riders real-time data, such as carbon dioxide emissions reduced, calories burned and money saved versus driving. Gotcha Bike has saved its users more than $46,400 on gas, maintenance and other transportation expenses across 18 markets since first launching in 2015. Everyone wants to park as close as they can to their class and most classes are scheduled from about 9:30 a.m. to 2 p.m. Therefore, more students are trying to park in the same places at the same time. Competition is stiff. It's pointless to circle a full deck or lot. Students do not generally come-and-go in steady streams but in hour-and-a-half bursts based on when classes begin and end. A full deck or lot at 9:30 a.m. will likely remain so until around 12:30 p.m. or so. A sweet way to send love and greetings from Niner Nation! 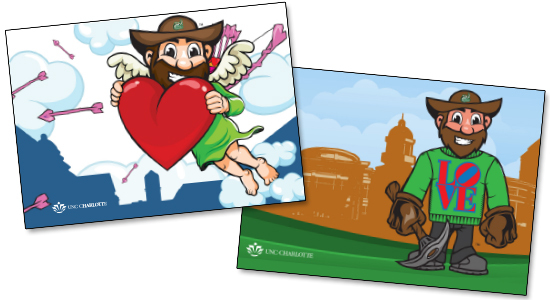 REPROS Copy Center, Union Station, and Mail & Package Services have Niner Nation Valentine's Day postcards available, free for the asking, while supplies last. REPROS and Mail & Package Services are located on the lower level of Prospector building; Union Station is on the main level of the student Union. Here's a PDF for those who want print-and-cut Valentine messages to give away personally. Great for school kids and little 49ers! CRI Campus just got smarter! A Smart Market self-checkout retail spot has opened in room 1209 of the EPIC building. What makes it smart? 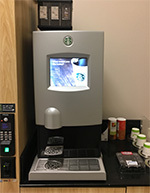 It's filled with fuel that thinking people need, like fresh coffee brewed by the cup, snacks, energy and soft drinks, grab-and-go meals and sandwiches. And it's powered by infrared, thumbprint recognizing, multi-camera technology to make shopping simple and secure (and very cool). Over 300 products are available, whenever the building is open. "I'm extremely excited to have a Smart Market here," said Rick Torres, vending program manager for UNC Charlotte Auxiliary Services. "Student and staff requests and our own surveys indicated both desire and need for a quick service food and beverage venue on the CRI-side of campus. And because so many people work in labs at off-hours and late at night, the concept would ideally need to accommodate them, too. Smart Market is a perfect fit!" Use a credit or debit card at the main kiosk or at any door. Just swipe and start shopping! Your cart will follow you throughout the entire shopping trip, going from one cooler door to the next until you’re ready to check out. As selections are made, the system tracks the items you pick up using patented infrared technology, displaying your shopping cart at each door. Adding items to the cart does not commit you to buy; there's plenty of time to browse and change your mind. The system only charges for items that you take away. Once your shopping is complete and choices are collected, visit the main kiosk to review your order, print a detailed receipt, or simply walk away. Each transaction closes out within sixty seconds. 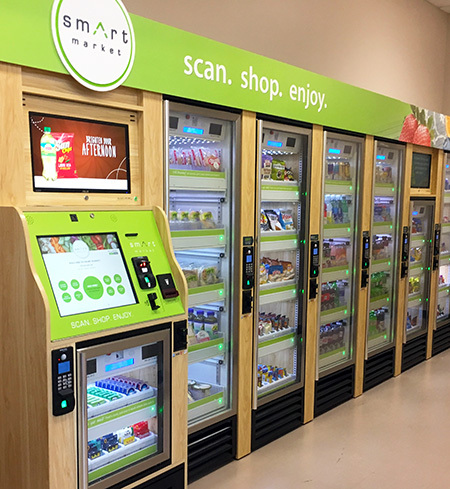 If you prefer to pay with cash or plan to visit Smart Market often, create an account at the kiosk or online at www.smartmkt.com. There, you will be able to access transaction history, make account updates or add funds online at any time. When shopping, you will be able to use your fingerprint, account card, QR code via the mobile app, or your username. The 49er Account (which resides on the UNC Charlotte 49er ID card) will be available to use in the near future. 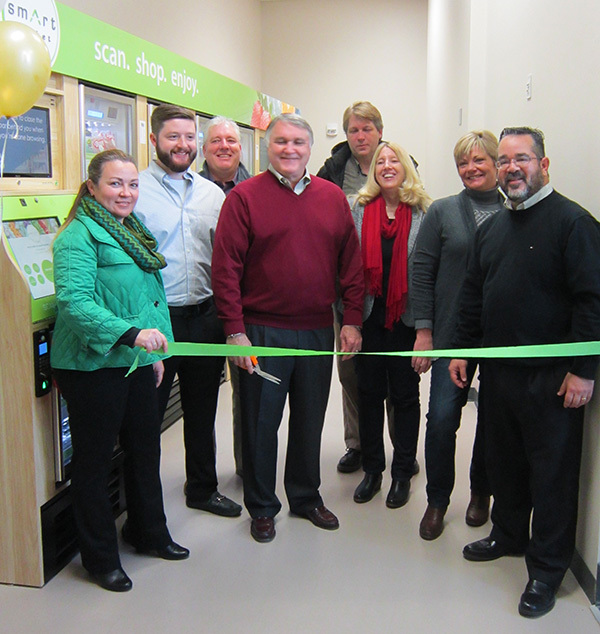 Ribbon cutting for Smart Market was held Tuesday, January 10. From left: Ana Alvarez, Auxiliary Services Director; Nick Taylor, Canteen Vending Services; Lee Anderson, Canteen; Keith Wassum, Business Services Associate Vice Chancellor; Drew Averitt, Business Services, Bev Guessford, EPIC; Robin Moose, EPIC; Rick Torres, Auxiliary Services. Relaxed enforcement is in effect Thursday, Dec. 8 through Sunday Jan. 8. PaTS Call Center line has someone available to help you 24/5 (weekdays from 5:00 AM continuously through 10:00 PM Friday). When in doubt, ASK, please! Your full-time permit is still worth money! Turn it in to the Parking and Transportation Services office for a partial refund. Here’s the link to the refund policy and schedule. Leaving your car on campus over winter break? A quiet campus can provide criminals with opportunity to strike cars parked in isolation. That's why Lt. Brian Thomas of Campus Police suggests that anyone who is leaving a car on campus over any or all of the break park in Lot 25 over by the Police and Public Safety building and North Deck. 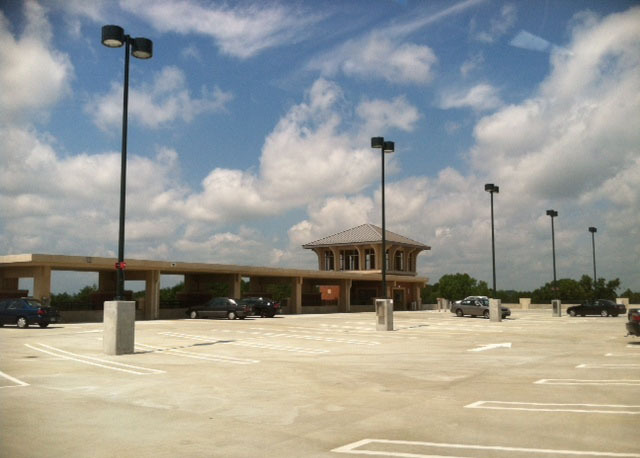 There will be a two-story observation tower there and your car will be within sight-line of working officers. 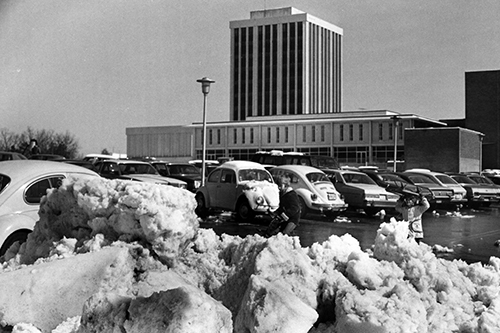 Photo: upper level Cone Deck after a snow from early 1970's. The Atkins Library Tower looked a bit dfferent then! There have been recent reports of near-miss accidents and some passengers misunderstanding where the buses may stop. There's a reason why the audio recording says, "Please, do not cross in front of the bus." Unlike school buses, traffic is not required to halt in both directions for municipal buses. Oncoming traffic continues; cars behind a bus may go around and pass. The only time it's OK to cross in front is when the bus is stopped at a traffic light. Even then, use caution and look both ways. NEVER run after or alongside a moving bus once it has left its stop. Take a breath and wait for the next one. The UNCCNextRide app will show you where the next bus is and when it's expected to reach your stop. Never assume a bus driver sees you. Lampposts, newsstands, sun glare and parked vehicles can obscure driver view. If you bike-n-ride, always approach the bike rack from the curb. When disembarking, let the driver know that you will be removing a bike from the bumper rack. Don’t cross the street between parked cars. When you walk between parked cars into traffic, you might not be visible to drivers. Wait until exiting passengers have stepped off the bus before boarding. Place backpacks on your lap or on the floor, taking care not to create tripping hazards near the aisle. During peak ridership times, slide over so someone can sit on the aisle-side without having to ask. When capacity reaches standing room, move toward the back of the bus so there’s room for others to get on. It's possible to get two lines of people down the aisle of CATS commuter buses. Helena Connors is the transportation manager for Parking and Transportation Services and serves as the operations liaison with Charlotte Area Transit. Here's how to reach her: hconnor2@uncc.edu; 704-687-0279. The CATS See Something, Say Something App allows you to report things like disruptive behavior, suspicious activity, etc. Lost and found: Leave something on a campus shuttle bus? All found items are taken to Charlotte Area Transit Lost and Found. Call 704-336-5326 to report a missing item. For items left on SafeRide transportation vehicles, call PaTS at 704-687-0161. "UNCC - 30,000 students & 1,000 parking spots," was an early September Tweet that's been liked and reTweeted nearly 200 times (so far). 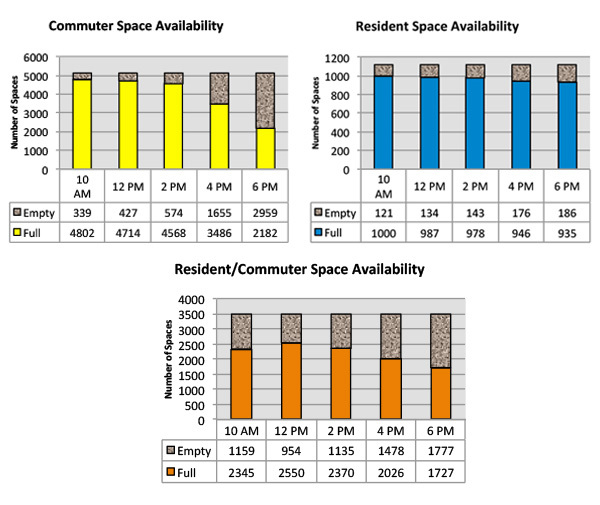 The numbers are wildly exaggerated, but weekdays when classes are most densely scheduled, it sure feels like a 30-to-one competition to park in Union, West and East 2 parking decks. But even at peak time when the closest parking areas are full, there are enough parking spaces open elsewhere on campus. 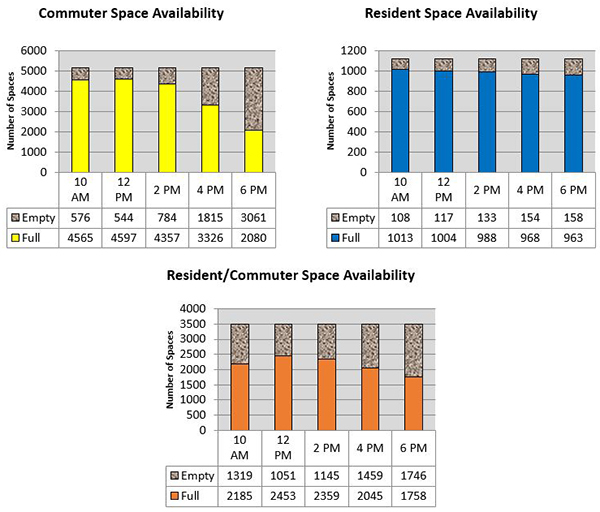 Space counts are taken a few weeks into every semester to check that parking supply is sufficient for demand. These counts also inform planning for future parking facilities. All parking designations are counted: resident and commuter students, facutly/staff, visitors, ADA parking, etc., but because students are the population for whom most of campus parking is designated, this post will focus on decks and lots open to those with student permits. Everyone wants to park as close as they can to their class and most classes are scheduled from about 9 a.m. to 2 p.m. Therefore, more students are trying to park in the same places at the same time. Your competition is stiff. It's pointless to circle a full deck or lot. Students do not generally come-and-go in steady streams but in hour-and-a-half bursts based on when classes begin and end. A full deck or lot at 9:30 will likely remain so until around noon, maybe longer. Even at peak class time, there are hundreds of spaces open in North Deck and the Green Line shuttle picks up there so you don't have to walk if you don't want to. The Haunted Union event is Thursday, October 27 and Chef Cindy is making sure that Crown Commons joins in the SPIRIT. Chef Cindy will apply her evil genius to Haunted Union with "Food Fear Factor." Score points by eating "goblin fare " without spitting any out. Those advancing to a second round will compete in a puzzle game. Round three is kind-of-like bobbing for apples but with marbles submerged in a tub of ice --- using only your feet. Participants and spectators are sure to have a great time! Put some Niner Pride on your front porch with these spirited Charlotte 49er patterns to download and use for Halloween pumpkin carving or painting.